A CNN Analyst Accuses Black Radio Host of Benefiting From White Privilege. Now He's Speaking Out. A CNN Analyst Accuses Black Radio Host of Benefiting From White Privilege. Now He’s Speaking Out. 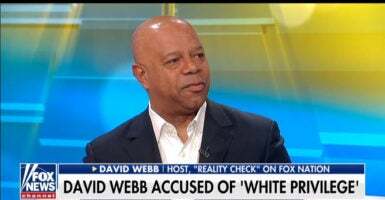 Black radio host David Webb spoke out on “Fox & Friends” Wednesday after he was accused of benefiting from white privilege by CNN analyst Areva Martin. Webb accused Martin of launching into a false attack against him and said she failed to gather the facts before speaking out. He also said there is no such thing as white privilege. He said Martin apologized for her behavior but also sold out her media team by blaming them for her failure. Webb also said Martin likely made assumptions about his race due to his show being on a conservative radio station and presumed he was white. “I talked about qualifications. I’d been through different genres in radio, as you know, rock, urban, hip hop, you name it. And I’ve been through different genres in talk. And it was because I did the work and that’s why I made the qualifications statement. But being on Patriot Radio with me and being on a conservative talk station, well, I must have been white, was in her head,” he said.